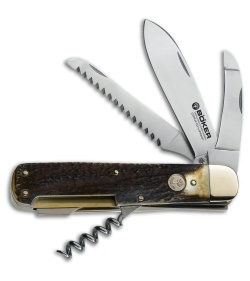 The Boker Hunters Quadro pocket knife with genuine stag scales is the perfect knife for your next hunt. Genuine burnt stag scales have a classic look while being lightweight and durable. Polished nickel silver bolsters with pinned construction makes for a sturdy, reliable knife ready to take the trials of the field. Set apart from other knives, CPM-CruWear steel with a Rockwell hardness of 62-63 results in an extremely fine edge with extraordinary wear resistance and significantly longer use between sharpening.